Photo courtesy of Sara Naumann. All rights reserved. Sara Naumann is a travel writer who currently blogs a column about travel in China called "Sara Says" for Air France's Flying Blue China Club and has written for Malaysian Airlines. Her work has been published in various books and magazines including "Urbanatomy: Shanghai 2008," Financial Times, CityWeekend Shanghai, and "Shanghai Lu: a Collection of Stories by Women Writers." Born to American parents, Naumann has lived in Asia most of her life, including in Japan and China for over 15 years. 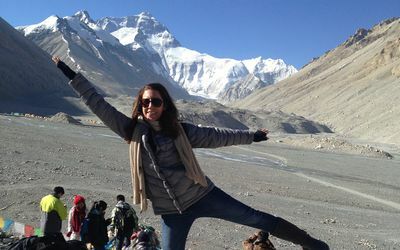 Sarah Naumann is a former writer for Tripsavvy whose work over the course of more than 10 years focused primarily on travel to Shanghai and mainland China. Naumann's work includes essays published in a local anthology "Shanghai Lu: a Collection of Stories by Women Writers," but her passion is travel writing. Her articles have appeared in various magazines and books including "Urbanatomy: Shanghai 2008" and CityWeekend Shanghai, and she also blogs for KLM/Air France's Flying Blue China Club. Born to American parents working at the American School in Japan, Sara even spent her formative years in Tokyo before the whole family moved to the family farm in Chestnut, Illinois. A degree in Japanese took her to Tokyo where she spent over four years working and studying. She traveled extensively in Japan and throughout Asia, including solo trips to China, Thailand, Vietnam, Cambodia, Laos, Nepal, Indonesia, Korea, Malaysia, and Singapore. Travel experiences fueled her passion for Asia, and after four years back in the United States, she jumped on the opportunity when she got a chance to live in Shanghai. Naumann has now lived in Shanghai for over 15 years and her experiences have given her a mixed palate and appreciation for the best that all of these places have to offer. Sara received her BA in Asian Studies, focusing on Japanese, and International Studies from Northwestern University in Evanston, Illinois. These days, she can be found in Xujiahui with her Mandarin teacher and her writing pal as they slosh through Chinese lessons together.